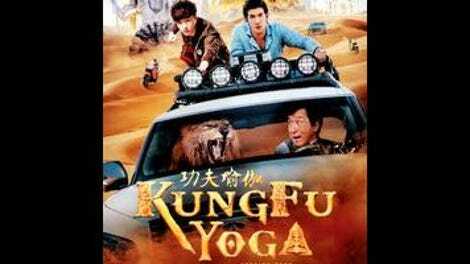 Kung Fu Yoga, which casts the sixtysomething Jackie Chan as a mild-mannered archeologist named (wait for it) Jack Chan, is an exercise in quantity over quality: an attempted return to the star’s Hong Kong action-slapstick roots, randomly assembled from pieces of Raiders Of The Lost Ark, Pink Panther-era caper comedies, and the little-loved mid-2000s Chan vehicle The Myth (for which it serves as a bizarre quasi-remake), with a Lord Of The Rings fantasy battle sequence, a Fast And Furious-type luxury car chase, a Bollywood dance number, and not one, not two, but four different scenes involving CGI animals thrown in for the hell of it. The non-stop cycling of locations, crowd-pleaser modes, and groan-inducing gags makes for some watchable silliness. But Chan, who reunites here with his Police Story 3: Supercop and Rumble In The Bronx director Stanley Tong (who also helmed The Myth), is no longer the energetic presence he was decades ago. But who would expect him to be? There is an entertaining early ice-cavern set-piece that shows that there’s still something left of the star’s kinetic talent, but only within limits; his timing is no longer split-second. And so, instead, Tong lets much the action fall on the shoulders of the stiff supporting cast. They disappear into the perfunctory dialogue—much of it in English—and into the film’s rapid, relentless costume changes. 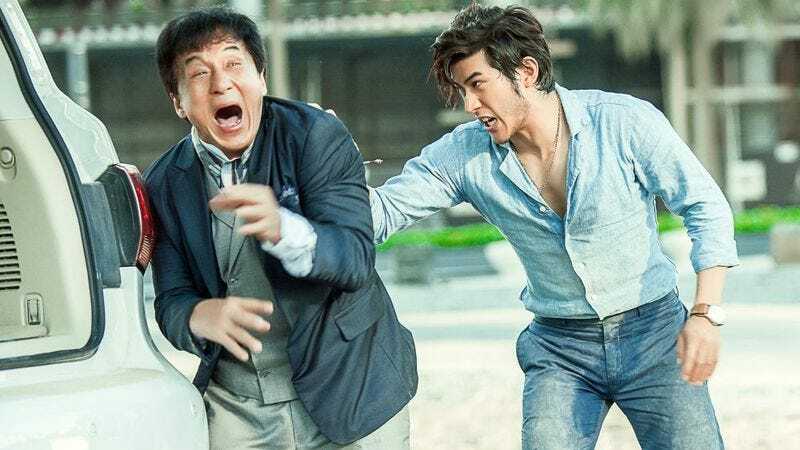 Speaking of which: Kung Fu Yoga features what may be the most extravagant collection of ugly clothes in the history of film. The costume aesthetic can only be described as “AliExpress clearance”; its crimes against good taste include sleeveless blazers, pocket squares the size of restaurant napkins, faux-fur hats the size of ottomans, a patchwork trench coat that would seem over-the-top on a Final Fantasy villain, random instances of the Red Hot Chili Peppers logo, and a jacket with Blaxploitation-grade lapels that is adorned with the seal of the president of the United States. Tong embraces garish, conspicuous kitsch. A generic villain named Randall (Sonu Sood) attempts to steal a large, purple gemstone of MacGuffin-ish historical significance, leading Chan and his Indian colleague Dr. Ashmita (Disha Patani) on an international chase across stock locales (Dubai hotel, Indian marketplace, etc. ), accompanied by their flirty, expensively coiffured grad students. The culture clash comedy is lazy enough that the film often gives up on it mid-scene. But that’s the way it goes in a movie that, true to its title, tends to stick different scene ideas together without much rhyme, reason, or follow-through. Does it need a camel-racing sequence? Or a barfing, carsick lion? Or several scenes devoted to futuristic technologies that have zero bearing on the plot? Of course it doesn’t. However, the absence of necessity or consistency has its appeal; it guarantees that the movie stays unpredictable even as it pilfers shamelessly, piling cliché upon cliché, but rarely in a way that makes a lick of sense. It’s the cinematic equivalent of those of knock-off action figures with a green Spiderman body, Wolverine claws, and a picture of Shrek on the packaging.